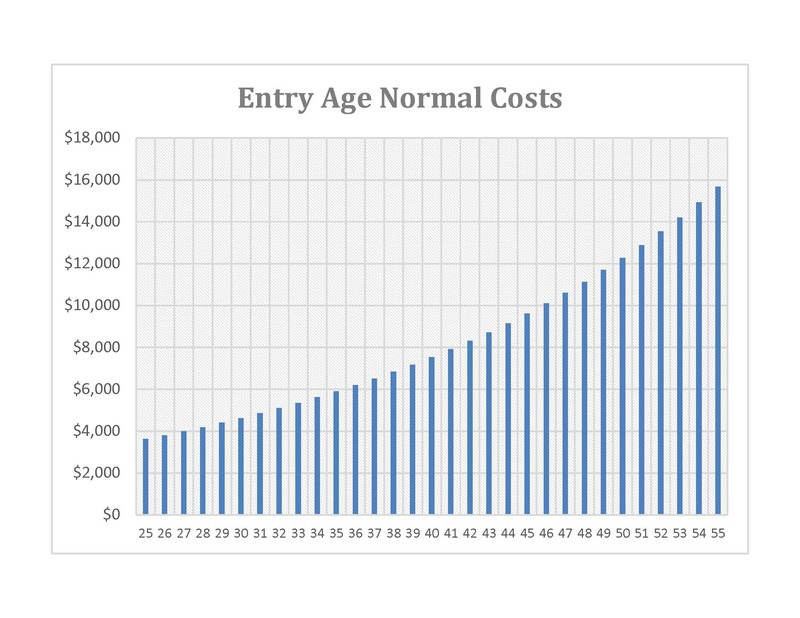 The Entry Age Normal actuarial cost method is the method used to determine annual pension plan members’ costs under the requirements of Act 205 of 1984. An actuarial cost method is a way of allocating the value of a member’s expected plan benefits over his working career. 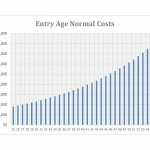 Under the Entry Age Normal method, a Normal Cost is determined for each year of employment such that each year’s normal cost is equal to the prior year’s normal cost, increased by the plan’s assumed annual rate of salary increase. An example of a typical pattern of normal costs is shown in the above chart. The sum of current normal costs over all active plan members is divided by the prior year’s W-2 payroll to determine the normal cost percentage to be used in the Minimum Municipal Obligation (MMO) calculation. The plan’s future normal costs will be funded as part of MMOs that are based on future actuarial valuations. The total actuarial present value of future benefits, as of the valuation date, represents the current value of all past and future normal costs. The value of future normal costs is called the present value of future normal costs. The value of past years’ normal costs is called the actuarial accrued liability. At each valuation, the unfunded actuarial accrued liability (i.e., the actuarial accrued liability, less the actuarial value of assets) is amortized over future years based on Act 205’s funding rules. The normal cost and amortization payment determined in the most recent actuarial valuation under the Entry Age Normal actuarial cost method is used to determine the Minimum Municipal Obligation which determines the plan sponsor’s required annual contribution.